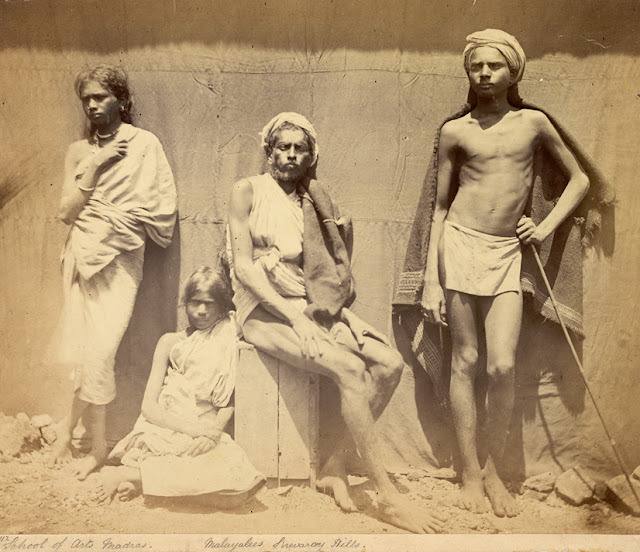 Photograph of two men and two women of the Malaiyali tribe in the Shevaroy Hills in Tamil Nadu, southern India, taken by an unidentified photographer in the 1860s, from the Archaeological Survey of India Collections. The Malaiyalis, or Hill-dwellers, were a homogenous community whose subsistence and economy depended exclusively on the forests. The figures in this image are posed against the exterior of a tent. This print is one of a series commissioned by the Government of India in the late 19th century in an attempt to gather information about the different racial groups on the sub-continent. Material was submitted by professional and amateur photographers working in studios and in the field; this photograph was attributed to the Madras School of Industrial Arts, an important training centre for photographers in the area, established in 1850.